The presented book The Idler Book Of Crap Towns II: The Nation Decides: The New Top 50 Worst Places To Live In The UKFrom Brand: Boxtree, Limited our company offer right here is not type of normal book. You recognize, checking out currently doesn't imply to deal with the printed book The Idler Book Of Crap Towns II: The Nation Decides: The New Top 50 Worst Places To Live In The UKFrom Brand: Boxtree, Limited in your hand. You can get the soft file of The Idler Book Of Crap Towns II: The Nation Decides: The New Top 50 Worst Places To Live In The UKFrom Brand: Boxtree, Limited in your gizmo. Well, we imply that guide that we proffer is the soft data of guide The Idler Book Of Crap Towns II: The Nation Decides: The New Top 50 Worst Places To Live In The UKFrom Brand: Boxtree, Limited The material and all things are exact same. The distinction is just the kinds of guide The Idler Book Of Crap Towns II: The Nation Decides: The New Top 50 Worst Places To Live In The UKFrom Brand: Boxtree, Limited, whereas, this condition will precisely pay. The Idler Book Of Crap Towns II: The Nation Decides: The New Top 50 Worst Places To Live In The UKFrom Brand: Boxtree, Limited. Let's read! We will certainly commonly find out this sentence anywhere. When still being a kid, mama used to purchase us to always review, so did the teacher. Some books The Idler Book Of Crap Towns II: The Nation Decides: The New Top 50 Worst Places To Live In The UKFrom Brand: Boxtree, Limited are fully checked out in a week and also we require the obligation to assist reading The Idler Book Of Crap Towns II: The Nation Decides: The New Top 50 Worst Places To Live In The UKFrom Brand: Boxtree, Limited What about now? Do you still enjoy reading? Is reading only for you who have commitment? Not! We here provide you a brand-new e-book entitled The Idler Book Of Crap Towns II: The Nation Decides: The New Top 50 Worst Places To Live In The UKFrom Brand: Boxtree, Limited to read. If you ally require such a referred The Idler Book Of Crap Towns II: The Nation Decides: The New Top 50 Worst Places To Live In The UKFrom Brand: Boxtree, Limited book that will certainly give you value, get the most effective seller from us now from several popular publishers. If you wish to entertaining books, several novels, story, jokes, as well as a lot more fictions collections are additionally launched, from best seller to one of the most current released. You could not be confused to take pleasure in all book collections The Idler Book Of Crap Towns II: The Nation Decides: The New Top 50 Worst Places To Live In The UKFrom Brand: Boxtree, Limited that we will offer. It is not regarding the prices. It has to do with exactly what you need now. This The Idler Book Of Crap Towns II: The Nation Decides: The New Top 50 Worst Places To Live In The UKFrom Brand: Boxtree, Limited, as one of the most effective sellers below will be among the ideal selections to check out. Locating the ideal The Idler Book Of Crap Towns II: The Nation Decides: The New Top 50 Worst Places To Live In The UKFrom Brand: Boxtree, Limited book as the best need is kind of lucks to have. To start your day or to finish your day during the night, this The Idler Book Of Crap Towns II: The Nation Decides: The New Top 50 Worst Places To Live In The UKFrom Brand: Boxtree, Limited will be proper sufficient. You can just hunt for the floor tile below and you will get guide The Idler Book Of Crap Towns II: The Nation Decides: The New Top 50 Worst Places To Live In The UKFrom Brand: Boxtree, Limited referred. It will not bother you to reduce your useful time to go with purchasing publication in store. This way, you will additionally invest money to pay for transport and also other time spent. 'Our national genius is knocking things down.' Jim White, Daily Telegraph From inner city poverty to self-satisfied middle England, from the dull and the lifeless to the ugly and the depressing, Dan Kieran and Sam Jordison are back with a brand new list of towns - and this time it's personal. Inspired by the success of the contentious survey, published in the Idler and in book form in Boxtree's smash hit Crap Towns, residents of the original 50 towns, along with plenty of new towns will have their say in Crap Towns II: To Hull and Back on why Britain isn't just the place of warm beer, cosy bed and breakfasts and amiable old gits that some travel books would have us believe. This brand new list of 50 towns will include new entries, non-movers and a new number one based on the public's reaction to the burnt out cars, shell suits, cheap shoe shops and housing estates patrolled by rabid dogs and feral kids that scar the face of this glorious kingdom. Are the disgruntled residents of Hull right to consider their town the worst place to live in the country? Crap Towns II will find out. "'Our national genius is knocking things down.' Jim White, Daily Telegraph"
Sam Jordison has written for the Guardian, the Independent, Heat magazine, FilmFour.com and the Idler. He studied Classics at Cambridge University, grew up near Morecambe and lives in Hackney. Dan Kieran is Managing Editor of the Idler. He also started the magazine's webste in 1999 which he has lovingly nurtured ever since. "They live where you wouldn't dare to drive.."
Anyone who has had the good fortune to travel to the UK will hit many of the great sights and cities - London, Edinburgh, York, Durham, Bath and more. But in your quick travels you may have wondered what the British locals feel about those unassuming or even visually disagreeable towns you zip past by train or drive through to get to Stonehenge, the Lake District, Glencoe, Glasgow, searching for Robert the Bruce. At the beginnings of Rick Steves European Guidebooks, there are large maps of the country in question. All of the larger cities are marked in colours of black or grey. Black locations are "places of touristic interest". But the grey locations are "places of little or no touristic interest." What are these "grey places"? 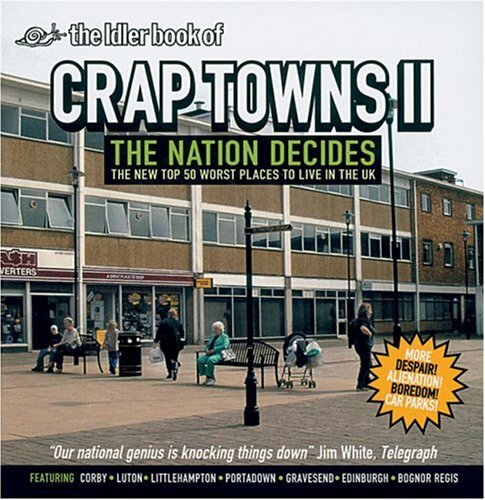 There is now a remedy - The books "Crap Towns" and "Crap Towns II: The Nation Decides" are mostly areas of grey, with despair, boredom, and poor council planning leading the way. Readers of the UK "Idler" magazine submitted letters filled with memories, testimonial, fear, dismay, sadness, bemusement, hope for the distant future. All so that a book could be compiled of the 50 worst cities and towns the UK has to offer. I will only list a few of the 50 - the fun is in being surprised. Hackney (for the second time in a row), Milton Keynes, Gravesend, Cleator Moor, Bristol, Sunderland, Kew, and (yes) Manchester & London. The book is thoughtful, blunt, bitter and humanist. The letters written to the Idler and put into the book are witty and thoughtful. The black and white photographs are perfectly chosen and will leave you invigorated in your bleak mood. Because this is a British book with British readers in mind, it helps to have a good feel for British slang, culture and perhaps history. But no matter. I cannot recommend "Crap Towns 1 & 2" more highly.